Bald Eaglecam: October 'nestorations' continue. 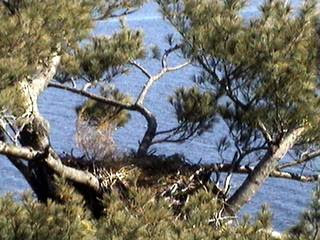 Hi All, many thanks for your comments regarding your observations of eagle activity at the nest. This has been a common trend for this pair and a good sign that they are considering nesting. Let's keep our fingers crossed! As you can see even without eagles the view is great. You're so right! Even without an Eagle (or a raven) on the nest THIS is the view that says BRI to me. I come here to just listen to the birds in the morning or just the white noise that I'm convinced is the water. When I want to sit and hope, this is where I do it. When I am rewarded! it's the best. Thanks so much for all you juggle, you are much appreciated every day. Breeding efforts on the way!